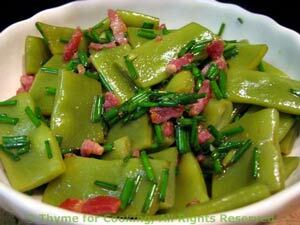 Warm Green Bean Salad, seasonal sides from Thyme for Cooking. Sauté bacon in a small skillet, cut into pieces if needed. Drain fat from pan, add beans, 1/4 cup water, cover and simmer until beans are just tender, about 10 minutes. Remove beans with slotted spoon or fork and put into serving bowl; keep warm. Add remaining ingredients, except chives, to remaining liquid in pan, bring to a boil, reducing to 2 tbs. Pour over beans, add crumbled bacon, chives, toss gently to combine and serve.